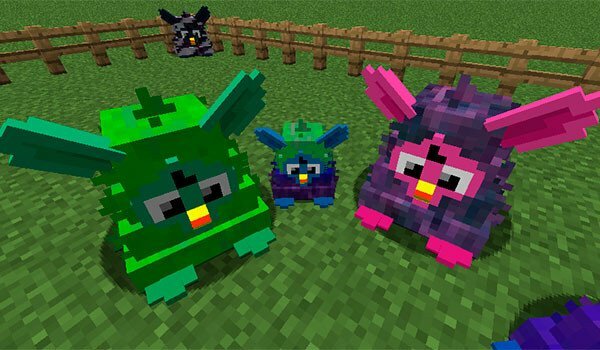 If you missing Furby, quiet, now you can have them in Minecraft. Furby Mania 1.8 is a mod that handles recreate the mythical beings furry, big-eyed and talkative, known as Furby. With this mod installed new mobs will be generated in your worlds of Minecraft. These new beings will Furbys of various kinds and colors. Among all variants of Furby, we find that some of them are benevolent, but there are others that are less so, and they are wishing kill you. In addition we also find hybrid Furby, such as CreeperFurby, FurbyGhast or EnderFurby. How to install Furby Mania Mod for Minecraft 1.8? Furby of various color in Minecraft!